The Office Supply Request and Office Supply Tips & List are free to download for your small business. 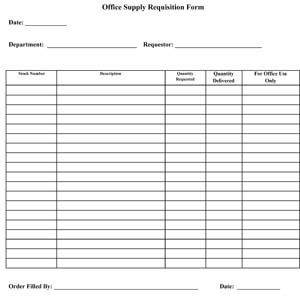 The Office Supply Requisitions are a small business form that helps you track office supplies by quantity, item, total, date needed by department. The Office Supply List (above) is a 2-page form that has all your office supplies listed by categories such as Administrative, computer and printer, desk, etc., and then you just mark quantity needed. Organization – This is vital when ordering office supplies. If you don’t know what items you currently have on hand you will never know what you need to order. Have your list (inventory) updated with all your office supplies (see office supply list above). You can use the office supply requisition also, which ever is easier. Always have the same person assigned to order office supplies as this will prevent duplicate orders. Communication – It may seem obvious, but many office managers in charge of restocking office supplies fail to ask their coworkers what they really need. There may be certain items that employees forget to mention so simply ask before ordering. Buy in Bulk – You can lower your cost of office supplies by ordering in bulk – usually bulk is considerably lower in cost. As long as you have the proper storage space and can be reasonably certain of going through the supplies, there is no reason not to order in bulk. Buy Re-Usable Ink Cartridges – Do you ever wonder why inkjet printers are so cheap? Because the companies that sells them mark up the ink cartridges that fit them. When you purchase a printer make sure you purchase a model that takes re-usable rather than disposable ink cartridges. You can save a significant amount of money by just replacing the ink not the entire cartridge. Shop Around – It’s a great idea to call around or surf the web and make sure your receiving the best rates on your office supplies. If one company quotes a price, then ask the other company to beat it.